Our latest Insider is leading efforts to create educational opportunities for public school youth in Oakland, CA. 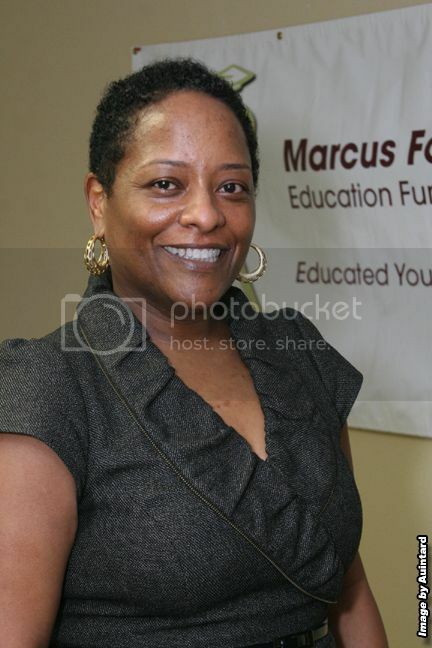 Alicia Dixon is the Executive Director of the Marcus Foster Education Fund (MFEF), named after the first African American superintendent of Oakland Public Schools. The Fund’s mission is to develop relationships and mobilize resources that create opportunities for all children in Oakland public schools to achieve excellence. This is accomplished by grants to teachers and youth, scholarships for students, workshops for parents on school success and technology training and home computers for families. Alicia grew up in Compton, CA and received a bachelor’s degree in Microbiology from the University of California, San Diego and a Master’s degree in Public Health from UCLA. Her greatest life achievement is being a mother to three boys ages 15 and 9, and a nephew, age 14. Our San Francisco contributor, Tokiwa Smith, recently spoke with Ms. Dixon to learn how she got her start in philanthropy, her advice to young professionals interested in educational philanthropy as a career and upcoming events for the organization. I can’t say that I ever chose philanthropy; it chose me. My public health training and background afforded me the opportunity to work across multiple sectors. I believe, and there is substantial evidence to support, the assertion that all issues in society require multi-disciplinary approaches and solutions. The relationships I was able to develop and the leadership roles I took on helped me to hone my analytical, policy and program development skills, with a very clear focus on equity issues in health, education, rebuilding the safety net and the criminal justice system. My work experience put me in constant contact with several funders at a time when I knew very little about the philanthropic field. The work I had a chance to support in various arenas exposed me to individuals who thought I could make a contribution to the field of philanthropy and fortunately I had the opportunity to work in a very progressive philanthropic environment with The California Endowment (TCE). After leaving The California Endowment, I was so inspired by the non-profit leaders that I had the opportunity to work with, that I decided my next employment opportunity would be in a leadership position in a non-profit organization devoted to improving educational opportunities for students with diminished educational exposure and opportunity. TCE is the largest health focused foundation and it was there that I found the hard evidence that education is the most influential social determinant of health. What advice would you give to young professionals that wish to pursue a career in educational philanthropy? Develop your analysis of critical issues and cultivate key relationships on the education landscape. Embrace your unique perspective, ability to identify and follow trends and to test and refine innovative approaches that impact the issue you seek to impact. Hone your ability to formulate and communicate well thought out ideas that will actually make a difference in people’s lives. Tend your commitment and passion for social change and your ability to think critically. They represent the art and science of philanthropy. Refine your ability to advocate with clear, concise arguments. Always have your elevator speech ready. Humble yourself and embrace the fact that without well-run and impactful non-profits, philanthropy is unable to achieve its mission. Manage with compassion the nonprofit philanthropic partnerships that you have the privilege to partake in. Always use the intent of improving conditions for underserved populations as your primary lens. This perspective will make clear the risks associated with making grants. Just remember there are always unanticipated positive and negative issues which arise in grant making. A truly successful grant maker is always thinking about how to take what works and is most impactful to other arenas. All of the points raised above will serve a professional working in any capacity in any field really. The key message is to do you and bring your best to all that you do. One of the Fund’s most recent projects is the Fatherhood Initiative. Why did your organization start this initiative and why do you think this work is important? We started the Fatherhood Initiative because only mothers were participating in our Family University program; both efforts target the parents of preschool age children to help families prepare them for kindergarten. Family University was not really conducive to the participation of fathers in that it is offered mid-day with a mommy and me type approach. The Fatherhood Initiative’s focus is more on decreasing the barriers to being an active and engaged father in the lives of their children and to support the academic success of the child. Several of the fathers bring their children (we have on-site day care available during workshop sessions) but the dynamic is very different in the way fathers support and encourage one another and how they seek out additional information and supports. Stay tuned as our goal with the Fatherhood Initiative is to establish a cadre of dads interested in participating in a policy group that engages the Oakland Unified School District concerning issues that deeply impact the children of the district. What upcoming events or projects can readers get involved in? We are proud as an organization to celebrate our 40th anniversary of support and partnership in the Oakland community. Our Celebration of Service is set for November 16, 2013 and tickets will go on sale soon. We intend to leverage this landmark by reaching out to all those who have been touched by MFEF, including those who have received a scholarship (an estimated 8,000 people), former teachers and administrators, school board members and community volunteers. We will celebrate all of the contributions they have made to the educational aspirations of the children of Oakland. Plans are currently underway to launch a volunteer campaign to support school site improvements as well and we encourage you to make a donation to the organization by visiting our web page and/or signing up to volunteer for our school site campaigns. Those interested should visit our website at www.marcusfoster.org, visit the contact us page and sign up. On August 8th, the College Bound Brotherhood will launch its Get Ready for College Event where 200 college-bound African American young men will receive critical information supporting their college success, build relationships with one another and know that the community is fully invested in their success. If you would like to get involved, please visit our contact us page and indicate your interest. Rome was not built in a day and the challenging issues we face in society will take generations to correct. Create work life balance that allows you to stay in the game long enough to witness the progression of the change you seek to achieve so that you can hand off the baton to your emerging comrades.